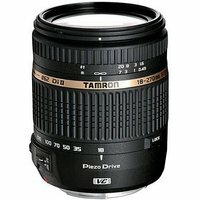 The Tamron 18-270mm f3.5-6.3 Di II VC PZD lens is a 15x zoom lens that features Tamron's unique Piezo Drive ultrasonic motor for silent, precise and extraordinarily fast autofocus. The 15x zoom offers focal lengths from 18mm at the wide-angle end up to a telephoto 270mm (29-432mm in 35mm equivalent) making it an ideal, all purpose lens. Despite its impressive performance, the Tamron 18-270mm f3.5-6.3 Di II VC PZD lens is both lightweight and compact, making it a great choice for travel photography. In addition to the Piezo Drive ultrasonic motor this Tamron lens features a Vibration Control mechanism to help keep images steady and blur free, even at maximum zoom.